So you have taken the time to write up a blog post and you published it. You may think, "great I am done now" BUT actually you are just getting started. You can get a lot more mileage out of a single blog post if you republish it on multiple platforms. Before you start creating your repurposed content do take a few minutes to consider your process and what you want you want to actually create. There are now three different ways to make videos on Instagram. 3. You can do a video that is 3-60 seconds long in your Instagram timeline. Since Instagram has the shortest video length availability other than the live version, you will want to make this video a quick summary. 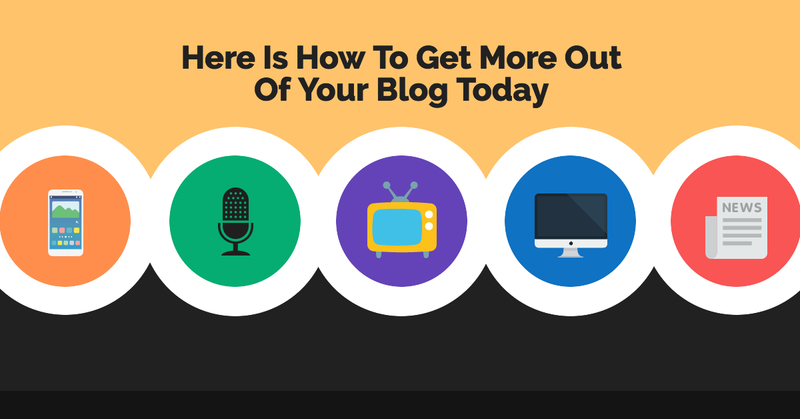 Leave enough room at the end of the video to direct people back to your blog. Note: Instagram videos only allow portrait shape videos. In other words you can't record your videos in landscape on your phone. YouTube videos provide for a ton of flexibility. You can either record a talking head video (you just look at the camera) or you can create a screencast tutorial (where you make a recording of your screen and you talking). Both types of videos resonate with people on YouTube but the talking head video is far easier to produce. You can just whip out your iPhone and start recording like I did in the video below. Note: It is best to make landscape videos for YouTube. With Twitter you have 2 video options. You can either do a Periscope (live video) or you can record or upload a video. Periscope and recording a video are both functions of Twitter directly from your phone. Note: The maximum length for a Twitter video is currently 2 minutes and 20 seconds. You can either do a Facebook live directly from your phone or you can sign up for Be Live and do it from the webcam on your computer. Even if you don't get many people watching your video live, remember that people can and will watch it in replay mode. After you release a new blog post send your newsletter lists a quick note alerting them to your latest post. However, add something additional in the newsletter that they won't see on the blog post. It is important to nurture this list and give them a reason to stick around. If you don't have a podcast of your own this is a great time to try and become a guest on someone else's podcast. Reach out to people and pitch your blog post as a topic. The worst that can happen is that they say no. Note: Be prepared for podcasters to say yes by having a decent microphone. This microphone is on $67 on Amazon and it is used by some top podcasters in the industry. You can create a quick power point slideshow or you can even use the free version of Canva to create a nice looking slideshow. If you want to step it up a notch you can hire someone from Fiverr to create you a slideshow. What republishing ideas would you add to this list?